Popeater is reporting that Warner Bros. has settled a lawsuit over a tattoo featured in The Hangover 2 and avoided the costly task of digitally altering its design for the DVD release, TMZ reports. News of a "mystery settlement" broke yesterday, and it looks as if the tattoo sported by Ed Helms' character in the film is here to stay. Warner Bros. says it has "amicably resolved" the copyright-infringement lawsuit brought forward by Mike Tyson's tattoo artist, S. Victor Whitmill. 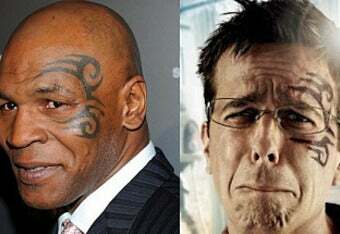 The facial tattoo sported by Helms' character in the film is a replica of the one on Tyson's face, and Whitmill was up in arms that his artwork was copied without permission. Whitmill tried, albeit unsuccessfully, to delay the May 26 release of the film, but still took the studio to court earlier this month for copyright infringement. Say what you will about the craziness of the tattoo, but it is indeed art — i.e., intellectual property. Warner Bros. actually dodged a bullet by not having to go back in and digitally alter all of the prints of the film, which would have been pretty costly. In the future, we're sure that film studios will be a little more respectful of tattoo art. Read more at Pop Eater. In other news: Candorville: A Mother Knows Best.